For many environmental lawyers practicing in multiple jurisdictions, it is often difficult to locate and track various state energy and environmental legislation. Oftentimes, practitioners must take a piecemeal approach to researching state bills. Making research all the more difficult, a single bill may be postponed in a house or committees for a seemingly indefinite amount of time. It could take years and multiple legislative sessions for a bill to be rewritten and then reintroduced. However, the National Conference of State Legislatures’ Energy and Environment Legislation Tracking Database has made it possible for practitioners to obtain real-time information and track bills introduced in all fifty states, the District of Columbia, and Puerto Rico. The National Conference of State Legislatures, or NCSL, is a bipartisan organization founded in 1975 with three unique goals: 1) “improv[ing] the quality and effectiveness of state legislatures, 2) promot[ing] policy innovation and communication among state legislatures, and 3) ensur[ing] state legislatures [have a] strong, cohesive voice in the federal system.” About Us, Nat’l Conf. of St. Legislators. With an emphasis on promoting state rights, one primary purpose of the NCSL is to ensure “state sovereignty and state flexibility and protection from unfunded federal mandates and unwarranted federal preemption.” NCSL Bylaws, Nat’l Conf. of St. Legislators. The NCSL allows users to utilize specific filters in each search, including topic, state, keyword, status, bill number, year, and author. After conducting a search, the results appear by state at the bottom of the page. 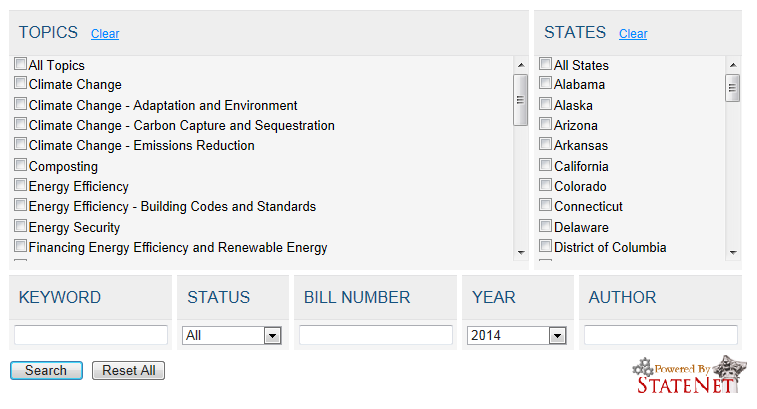 Each result will have a bill number, status, date of last action, author, topics, and a summary of the bill. In addition, the database allows users to view the history of the bill. The one apparent “flaw” is that the database does not include the text of each bill. 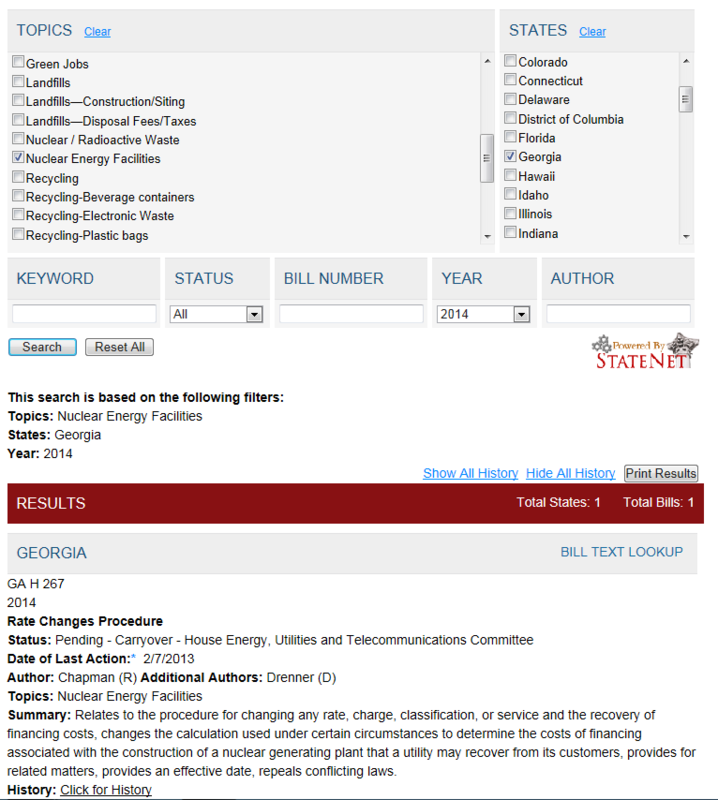 To view the text, a user must click on a “BILL TEXT LOOKUP” link that directs the user to a state legislature’s homepage (not the specific language of the bill). 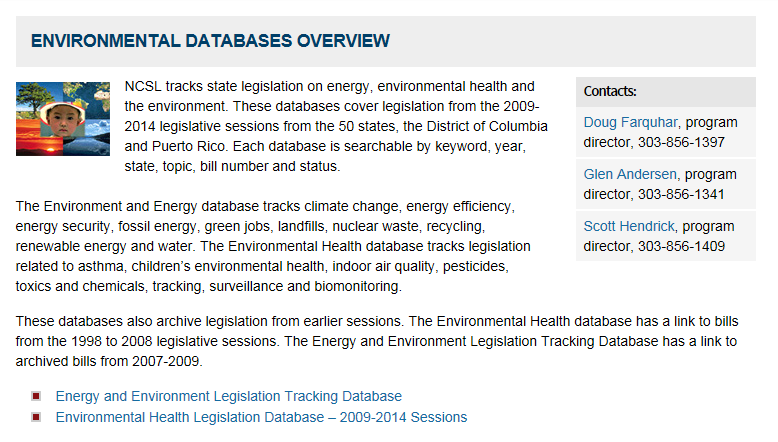 In addition to the Energy and Environment Legislation Tracking Database, the NCSL publishes energy legislative updates and reports. The publications are valuable resources to any practitioner searching for a state-by-state survey of energy policy under a variety of topics. A user can then view each publication on the NCSL website or download each publication in a PDF format.